Each piece is 7-8 cm tall. The Power of the Sea vs the power of the fiery underworld. Chess men arrive in a nice box with protective casing. Beautifully detailed. See secondary pics. 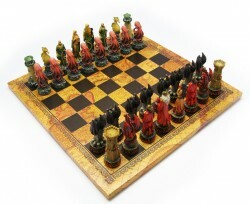 The chess men are hand painted and solid cast resin. Great details. Wooden leatherette Board measures 33 x 33 cm (13 inches). 2cm thick. Board made in Italy.